Coventry Citys old Highfield Road stadium was Englands first all seater football ground way back in the early 80’s, however this was changed after Leeds fans tore out seats and used them as weapons in 1981, of course it was redeveloped back into an all seater ground in the mid 90’s as were most football grounds. 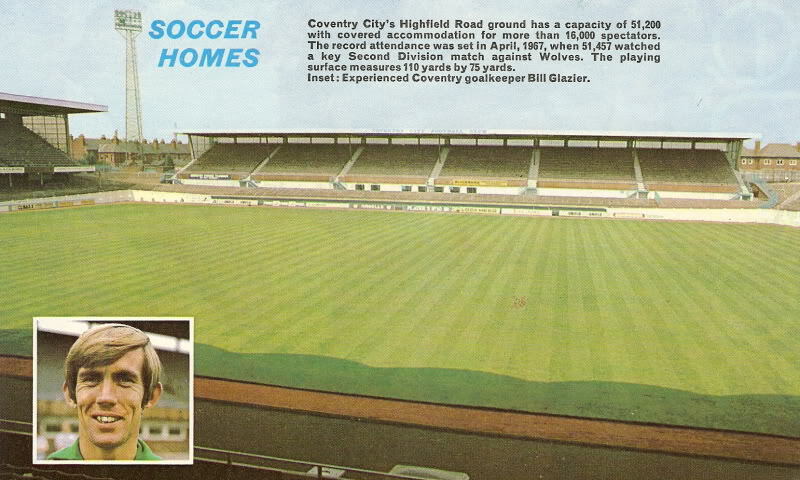 Coventry played at the city centre football ground Highfield Road from 1899 up until 2005, the ground has since been demolished, the picture below is taken from a 1970's Football Review magazine. "Coventry Citys Highfield Road ground has a capacity of 51,200 with covered accommodation for more than 16,000 spectators. The record attendance was set in April, 1967, when 51,457 watched a key Second Division match against Wolves. The playing surface measures 110 yards by 75 yards. Inset : Experienced Coventry goalkeeper Bill Glazier."